Experience pure alkaline water with the incredible Japanese Alkaline Water System! 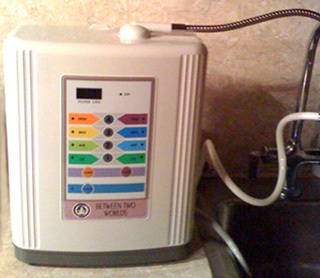 Between Two Worlds is proud to offer our own Alkaline Water Filtration System! Extremely popular in Japan and used in over 200 Japanese hospitals, alkaline water filtration systems produce pure alkaline drinking water that is rich in minerals and contains active hydrogen ions that possess strong antioxidant properties. Healthy alkaline water is a pure and natural liquid anti-oxidant. Alkaline water is created by filtering and ionizing your ordinary tap water through the process of electrolysis. The resulting ionized alkaline water contains powerful antioxidant qualities that provide many amazing health benefits. Our Alkaline Water Filtration System is the easiest and most economical way to maintain a healthly lifestyle by drinking delicious fresh water right out your faucet at home everyday! (Dr. Robert Young discusses pH balancing, weight loss, & the benefits of alkaline water; This CNN video footage is available on YouTube. (This vintage Japanese video footage is available to the public on YouTube; this extremely informative video is public domain and trademark-free).  Clean alkaline water: Great for drinking water, taking with medications, preparing baby formula, etc. Water impurities such as chlorine, rust, & lead are removed by the alkaline water machine's elaborate water cleaning filter.  Regular alkaline water: Also great for drinking water, food preparation, making tea or coffee, using in soups. Good for pre-cooking food, improves the taste of food. Also good for pets' drinking water and watering plants.  Strong alkaline water: Also good for food preparation and pre-boiling foods. Good for cleaning dishes, utensils, cutting boards, general kitchen cleaning, etc. Strong enough for stain removal.  Regular acidic water: Not suitable for drinking. Great for personal hygiene, washing face, taking baths, washing & rinsing hair, shaving, etc. Promotes beautiful skin. Good for laundry/washing clothes. Good for washing fruits & vegetables. Also good for household cleaning, washing tiles & floors, polishing glass, removing stains, etc. Also good for grooming pets.  Strong acidic water: Not suitable for drinking. Great for cleaning and disinfecting, kills germs and bacteria on contact, sanitizes cutting boards, knives, kitchen utensils & appliances, dish towels, etc. Promotes excellent hygiene, disinfects hands & face, disinfects toothbrush, disinfects food products, etc. Order the Japanese Alkaline Water System for your home or business today! Make a commitment to a lifelong healthy lifestyle and start experiencing the countless healthy benefits of our incredible Japanese Alkaline Water Filtration System today!